President Dwight Eisenhower once said,” The best morale exists when you never hear the word mentioned. When you hear a lot of talk about it, it’s usually lousy”. Evidently my drill sergeant never read this quote because I can still remember him standing about an inch from my face and screaming, ” Trainee, you WILL HAVE good morale”. That was about the time that I decided that I should have entered basic training at 18 years of age rather than at 21 years old because by then I had a brain, and realized that you could not force good morale upon anyone. At Riverview, we work and function more as a family unit than a rigid reporting structure. Each employee has the same goal from bottom to top–making certain that our guests have a world class hunting experience. In order to achieve that mission, each employee is encouraged to offer suggestions and advice on how to improve the Riverview experience. There is no doubt in my mind that the introduction of our English Cocker flushing and retrieving dogs has been a game changer here, and I will be the first one to admit that I fought this suggestion harder than anyone. I’m now a committed believer in this program. Our hunting is safer, and more challenging because of the Cockers. Also, we are not losing nearly as many dead birds. 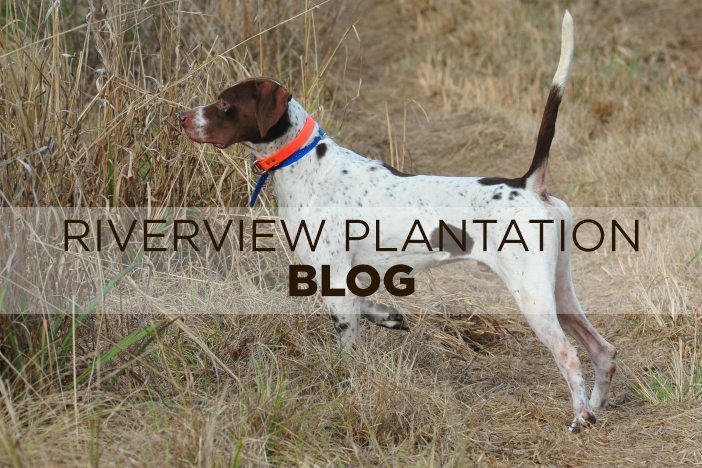 If there is a negative aspect to this program, and I do not see it as such, we are not killing as many birds as we have in the past because these little dogs encourage a greater covey burst, and we sometimes can’t mark any singles down; so we find ourselves having to go hunt for another covey. In closing, please allow me a personal moment to say that Rivevrview lost a great friend and guest this week, Pat Fallon. Pat had hunted with us for over 16 years, and we will all miss his quick wit and bright mind.